If no water, or a spluttering supply, comes out of the hot tap when its opened, the likely cause is an air lock. If you have an automatic washing machine, and have both the hot and cold supplies connected, an effective remedy can be implemented quite easily. The cold water to at least one of the downstairs taps will be connected directly to the mains (this is generally the kitchen sink tap). The washing machine will be connected to this run of cold pipe as it needs mains pressure to work properly. The mains pressure of the cold water is much greater than that of the hot water and we can use this greater pressure to push any air locks back to the hot water storage tank. 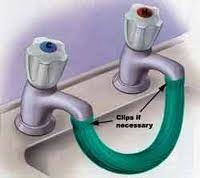 Disconnect the cold water hose from the back of the washing machine (Turn the valve off first). Disconnect the hot water hose from the valve on the hot water pipe. (Turn this valve off first also). Now connect the free end of the cold hose, to the free, hot valve. Turn on the hot water valve and then the cold water valve. This will now allow the greater pressure of the cold water to push any air back up the hot water pipe. Leave both valves open for approximately 30 seconds and then close, cold first. Now check the flow from the hot tap at the kitchen sink and the air should have been dispelled. If not repeat above. If, after 3 attempts, the problem is still there, please contact a plumber from our directory ( Locate a specialist ). There may be a problem with your system. If your washing machine only has the cold connected, another way of utilising the higher cold pressure to clear an air lock is by connecting the cold tap to the hot tap. This can be done, in most cases, with a piece of hosepipe and a couple of jubilee clips. Make absolutely sure the connections are sound and do not leave the taps unattended. If you have a mixer tap in the kitchen, the same method can be used, but you will need a longer piece of hose to utilise the cold from the mains tap and the hot from another tap.